Whether you were at home or at the office, you had to be hooked into a line that would allow you to reach the printer, or else you could not print. However, with the advent and popularity of the wireless internet, that is no longer a worry. Indeed, today wireless printers are plentiful and good for all needs. But with so many companies on the market selling wireless printers for so many uses and directed at so many people, which is right for you? Which is the best overall? 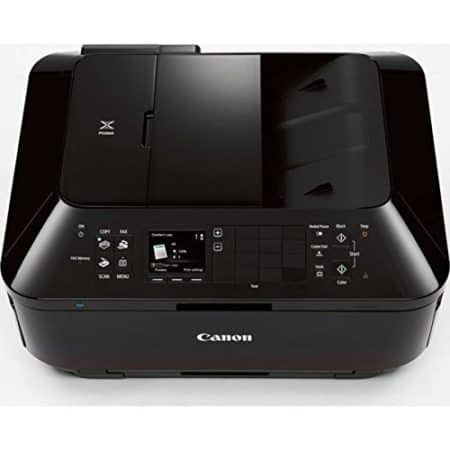 This guide is here to help you find not only the best wireless printer but the wireless printer that will be best for your particular needs and uses. First, however, let us look at a chart comparing the candidates for the title ‘best wireless printer’. Now that we have a good basis for swift comparison between the various printers that we reviewed, you can get a feel for which one might meet your needs, whatever they may be. Now, however, it is the time that we look at and consider the various printers that we looked at in a more in-depth manner. Epson is a company with a long history in the world of printing. Their history of work in printers goes back to 1966 when they invented the world’s first mini-printer. To put it simply, Epson knows how to put together a good printer, and they have been doing so for quite some time. Their XP-330 printer is a fantastic and affordable offering and one that comes from an impressive lineage of printers. 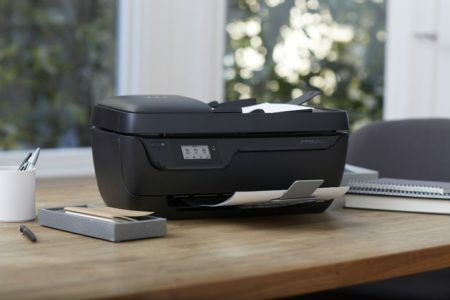 It works wirelessly, and it even works Wi-Fi Direct, which basically means that instead of having to route the communication with your printer through a router, you can simply connect your wireless device (tablet, laptop, whatever) with the printer. This saves you money, and it cuts down on hassle. As far as working with computers, it works with MAC and Windows operating systems. In its price range, it is the best wireless printer for Mac computers and operating systems. You can connect with a USB cable, or wirelessly, whichever you prefer. A nice touch is that it allows you to print directly from your phone. This is great for most of us because we spend so much time with our phones. That means that many of our photos are on our phones, not on cameras or discs, and so being able to link to the printer and print directly from your phone via an app is a great thing. You can also print via memory card using the controls and screen built into the XP-330. Now, that is not to say that the printer is without its issues. The big one that comes to mind is that the printer, when any ink cartridge runs out, ceases to function until it is refilled. This is fairly common in modern printers, sadly. Let’s say you’re printing a black and white page of text and the color is out; the printer doesn’t differentiate and simply will read that as the printer being out of ink. All things considered, this is a good printer at a good price, and definitely a good offering from Epson. Canon is a company more known for its cameras than anything else. Like Epson, it’s a company from Japan, a company that has a good history in the printer market. Their history in cameras and photography, in fact, has helped them in the endeavor, since printing and photography have a lot in common when it comes to color saturation and other indications of picture quality. 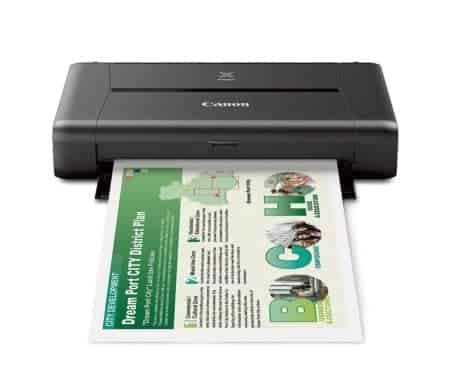 Canon’s MX492 is another one of these ‘small-in-one’ printers, printers that can copy, scan, and of course, print. This one can even fax (though why you would ever need to fax something I cannot understand). It’s a standard color printer that provides a lot of functionality for an affordable price, and that is always a great thing. It’s a fairly unremarkable printer, although it does have the distinction of not deciding to brick itself anytime one of the ink cartridges is out of ink. That alone makes it better than the Epson mentioned above, in my estimation. The scanning is unremarkable, but it works just fine. As a fax machine, it has memory for up to 50 pages, and it can broadcast at 3 seconds per page for a black-and-white page, and about a minute for a color page. It has a 33.6kbps modem, which some of you may remember as being slower than the last modem you had before the death of dial-up. 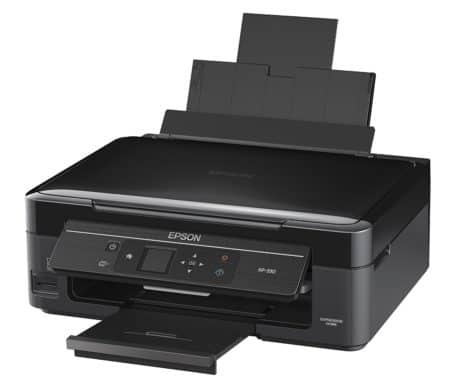 As with the above Epson, this printer is capable of printing from wireless devices with the use of apps like Google Cloud Print and AirPrint. You can, of course, also print from your computer, once you download the appropriate driver. This is a great and affordable printer. 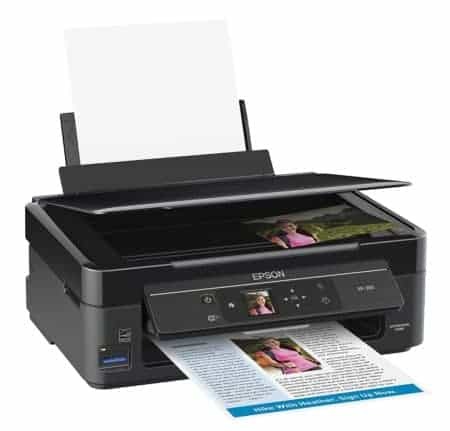 In some ways, it is even better than the Epson that we began with, especially in that when you run out of ink in one cartridge, it does not suddenly brick the device until you replace the ink. So far, we’ve reviewed only ‘all-in-one’ printers, printers that do everything. They scan, they copy, they print, and they even fax in some cases. If you need that kind of functionality, that’s great, but not everyone does. Indeed, an old saying instructs us to ‘keep it simple, stupid’; the idea being that the more functionality you have (that you don’t need), the more there is that can go wrong with your device. This printer is a printer and nothing more, printing in brilliant color. It’s not loaded down with functionality that you don’t need (like a fax machine. It may be nice to have that function, but when is the last time that 99 percent of us had any need to send a fax); it’s a printer with two sizable paper trays. How big are those paper trays? Well, it comes standard with room to hold 300 pages in the two included trays, but that can be expanded to up to 1,050 pages total. That’s enough paper that even the busiest of offices won’t have to refill very often. The ink also lasts quite a while too, lasting for about 4,500 black pages or 4,000 color pages before having to be replaced. Since this printer is only worried about being a printer, it is a very good one. Its connectivity with mobile devices is amazing. You can utilize a wide range of apps, including an app that Brother made themselves. You can also hook to the printer using Wi-Fi Direct, which is always a much easier way to hook into the printer than having to work with a router. If you’re looking for something a bit more stable, you can always hook up with an ethernet cable. And, of course, you can also print from a USB port using a memory stick or something similar, a port that is mounted on the front of the printer. If you’re looking for a color office printer, this is a great and very affordable option that you can expand as need dictates. 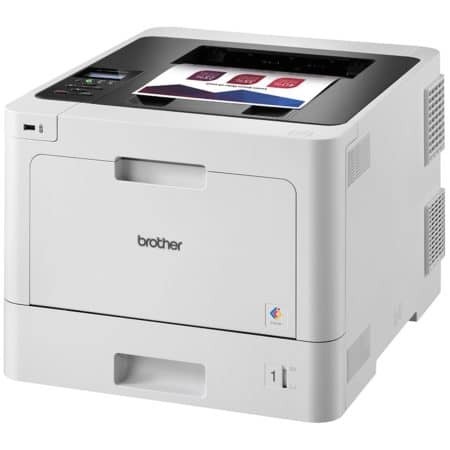 In our second offering from Brother, we have a printer that is as bare-bones a printer as you can get when it comes to what it offers. No scanning, no copying, and no fax functionality, but it will print, and it is a great wireless printer. Now, before we get any further, I want to make it perfectly clear to you; this printer is a black and white printer. It does not print color. It prints solely in black and white and shades of gray. That being said, for most businesses, especially for internal uses like putting together reports and paperwork and recordkeeping, you will not be likely to ever need color. Now, as far as being a wireless printer, this is one that will work with almost anything you own. You can hook to this printer wirelessly using AirPrint, Google Cloud Print, Brother’s mobile printing app, and Cortado Workplace. It also works over Wi-Fi Direct, which is a simple way to make sure you can print with a minimal amount of hassle. The big downside here is that while it works well wirelessly, you can’t hook it up to the internet via an ethernet cable, which would provide the most stable connection possible. You can, however, use a USB drive to print from. So how does this black and white printer work? Well, it’s a laser printer that can put out about 27 pages per minute. That’s nothing to sneeze at. This isn’t one of the best all in one printer 2018 has to offer because it knows that it wants to be simply a printer, and nothing else. 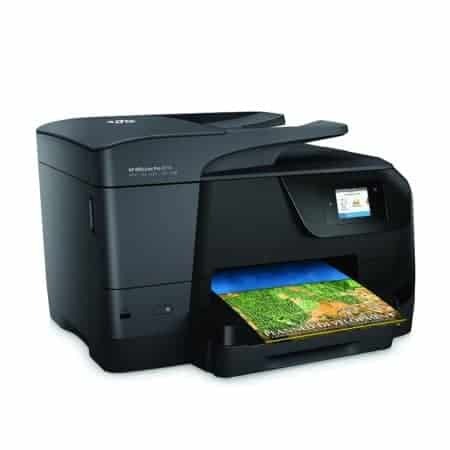 However, when it comes to printing in black and white, you will find few printers that are capable of competing, and fewer still so accommodating of so very wide a selection of wireless connections. HP is a well-known company in the computer world. They actually began producing consumer computers, they were one of the first companies to see silicon valley as it would become known (for its computer companies), and they even once employed the famous Steve Wozniak. It’s a company, in other words, that knows a bit about computing. Their OfficeJet 3830 computer is another ‘all-in-one’ printer, capable of printing, scanning, copying, and even faxing. While it has all those functions to offer, it can only be hooked into via the use of a wireless access of some sort. As far as app compatibility, it can work with AirPrint, the HP ePrint app, and even via Wi-Fi Direct. Now, this HP printer (and many of their more modern printers) come with a subscription service that sends you ink when you’re close to running out, called Instant Ink. Instant Ink works kind of like phone service used to back when people had to pay for minutes and texts, including a roll-over system for unused pages (and it even includes the limit to how much you can roll-over). Depending on which of the three plans that you choose, you will be able to roll over between fifty and 300 pages. The plans cover, incidentally, 50, 100, or 300 pages of printing in a month, and provision ink for each. These plans range from 2.99 to 9.99 USD a month, and they ship the ink right to you and claim that they can offer you immense savings. This is a good printer for casual home use, or, again, for a college student. If you’re running a business or something like that, you may want to look better. As far as HP’s Instant Ink program goes, you can decide if you think it’s profitable, although I would suggest that their claims of savings are immensely exaggerated. Of all the printers that we have looked at thus far, this is, hands down, the highest-resolution printer that we’ve seen. Its resolution is an astonishing 9600×2400 dpi when printing in color, and that means that you’re going to be able to print out photograph-quality pages. Of course, it’s not just capable of printing; it’s a wireless all in one printer. It can print, it can copy, it can scan, and it can fax. It’s a capable fax machine, with a memory of about 250 pages, and a transmission speed of 33.6 kbps, which means that you can send a black and white page in about 3 seconds, and a color page in about a minute. It makes a decent fax machine if that’s what you need. However, where it really shines is as a printer, of course. It is capable of printing with amazing clarity. As far as being able to utilize wireless connections, it can utilize AirPrint and Google Cloud Print, as well as a variety of other printing options. It can do a lot to make sure that you are going to be able to print your documents or pictures without having to actually hook up to a laptop or hard wires to the printer, which is a nice touch. You can also print from a USB, or hook in directly with an ethernet cable if you so desire. 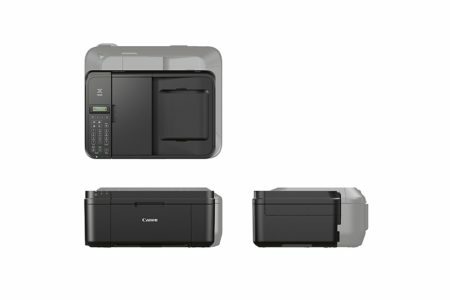 Something interesting about this printer that we haven’t seen yet is that you can hook into the Canon PIXMA MX922 with a Bluetooth device. Bluetooth connections tend to be a little bit more stable, so that may be a preferable way to connect for some people. If you’re looking for an all-in-one printer that can also provide you with beautiful, high-resolution and high-definition printing, then this is definitely the printer that you should be looking at. If you’re looking for an office space printer to be shared among a few workers? This may not be the printer for you. Please note: This printer sells bundled with a Corel 8 software download, and the link doesn’t work. If you’re looking for Corel 8, you may have to look elsewhere. 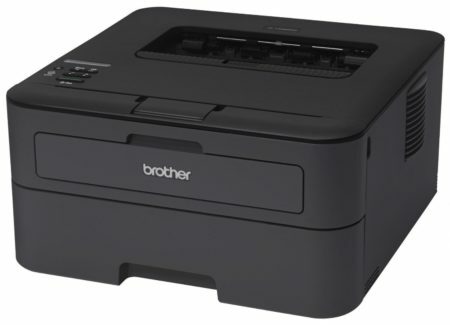 The Brother HL-L2380DW is a more budget-oriented answer to the Brother HL-L8260CDW that we reviewed up above. As has been mentioned before, color is a nicety. It’s not something that you need for business and office uses, for legal uses, or even for government uses. Color printing is something that adds cost and does very little else, from a business standpoint, and because of this, most printers for internal users do not print in color, but only in black and white. 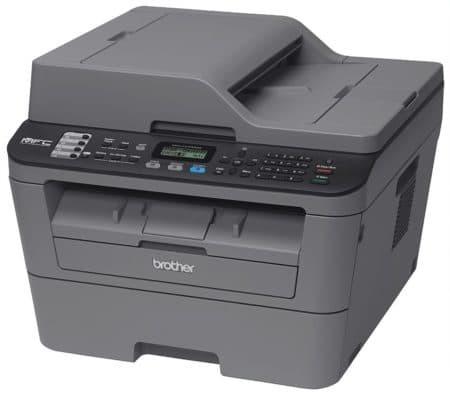 That makes the Brother HL-2380DW a good choice for an office that may need a lot of printing to be done. So how well does it work as a printer? Astonishingly well. 32 pages per minute well, in fact, and it is designed to be able to handle 2,000 pages of printing in a month with ease. It can also copy and scan (and it scans in color, which is a nice touch), meaning it can do almost everything that you will need from an office printer/scanner/copier, and all at a very affordable price. But what about the connectivity? Well, it’s open to a wide variety of connection types. You can utilize the usual, AirPrint and Google Cloud Print, of course. You can also make use of Brother’s own app, Cortado Workplace, and a Wi-Fi Direct connection. Better still, you can connect your printer to DropBox, Google Drive, Evernote, OneDrive, OneNote, Box, Facebook, Flickr, and Picasa web albums, should you so desire. This printer is setup with Amazon Dash Replenishment Service. How this works is that you set it up with your account and with your device (in this case, the Brother printer that you’ve purchased), and then the printer, which is connected to the internet, auto-orders toner as needed. This is great if you’re printing a lot, or if you are the kind of person who is liable to forget that they need to order ink and toner. There is nothing worse than having a work day halted because you completely forgot that you were almost out of the necessary parts to work your printer. This is a great small office printer, or home office printer, and one that is well worth the price, with a lot of bells and whistles and great functionality. Definitely, something that you should look into. A great duty life – up to 10,000 pages a month! 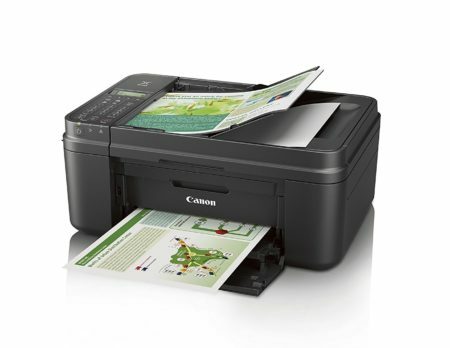 Before we get too far, let’s be very clear; this offering from Canon is a mobile printer. It is designed for the person who may need o print on the go, not for someone who is printing posters or something similar. It will not print anything larger than your average legal sheet of paper, but if you’re printing business papers or you are printing something like a small photo, this is a good printer for you. This is another document that produces high-resolution pictures, however. It, too, prints color at a resolution of 9600 x 2400 dpi, meaning it will produce quality pictures. The downside is that, because it is a smaller printer with fewer nozzles, it is going to take it a little bit longer to print the images. It works with the vast majority of common operating systems, so there’s no fear there if you’re a Mac or iOS user. However, when it comes to connecting, it is somewhat limited. You can connect via wireless or USB, which means that if you’re on the go and you’ve opted to pay for the additional battery, you can just connect your computer or phone via a USB cord. It can also work via wireless LAN or PictBridge. Those are your options for connectivity. So who is this printer made for? It’s made for people who need to print quality images and papers on the go. Really, it’s for photographers, realtors, people like that. People who spend a lot of time on the go, but may need to print something (like a flyer for a house) while they’re out and about; people who work from a car or any flat surface that they can find. If you’re looking for a home printer or an office printer, you may want to look elsewhere. If you’re looking for an all-in-one printer, this isn’t for you. But if you want a printer that weighs less than five pounds that you can take everywhere you go, this is the printer for you. The HP OfficeJet Pro 8710 is the mid-grade printer from the current OfficeJet line, and is priced accordingly. And if you’re looking for a printer for your home office or for a small business, you will find that this is a great addition to your office space. It’s made to keep pace with your printing needs. It can crank out an impressive 22 pages of black and white print in a minute, as well as 18 pages of color print in the same time-span. That’s impressive, especially for a printer that you don’t have to have professionally installed. As you may be able to see the image above, it also comes with a USB port on the front, through which you can run a cable to your computer, or which you can use to insert a USB hard drive and then print from the hard drive utilizing the onboard controls. 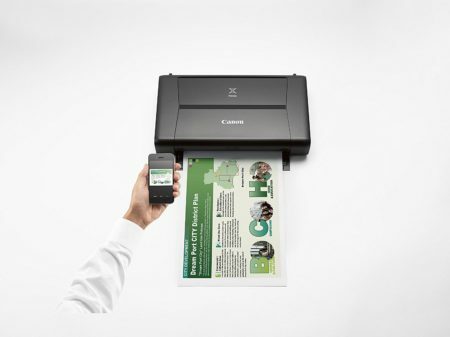 As far as wireless connectivity goes, it can work with the HP ePrint app, of course, as well as with AirPrint, Mopria, and Wi-Fi Direct printing, as well as through a router. It includes an Ethernet port as well, which will make it much easier for you to create a very stable connection. This printer does not produce as high-definition a product as some of the other printers that we have reviewed, printing at, at best, 4800×1200 dpi. If you’re looking to print gorgeous flyers and the like, this may not be the printer that you are looking for. However, if you’re doing mostly internal documents, record keeping, or charts and graphs for meetings and the like, then that resolution will be more than enough for your needs. 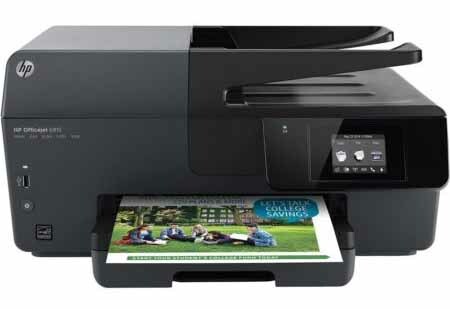 This is another printer that utilizes the ‘HP Instant Ink’ service. If you’re running a home office, or you’re in college or something similar where running out of ink would be a huge problem, you may want to invest in this service. It’s a good printer for generally lighter use, like you would see in a small office. If you’re looking for a workhorse, you’ll need to look elsewhere. Still, for a college student or a home, it’s a fantastic all-in-one printer at a great price. Samsung is not a company you normally would associate with printing. Indeed, they are more widely known for their work on cellular phones, televisions, and even computers (they came up with the concept of making slim laptops that were still powerful but with no disc drivers). But in almost everything they do, they do their work quite well. 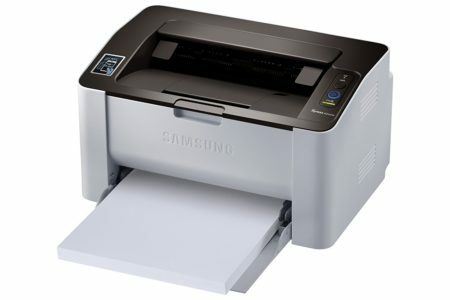 This printer is extremely affordable, as are most of the things that Samsung puts out. But what is really important, of course, when it comes to a wireless printer, is making sure that the printer is easy to connect to. A printer that you cannot connect to is not a printer that you can use, after all. Thankfully, Samsung knows what they’re doing. Samsung does, of course, make the wildly successful ‘Galaxy’ line of cell phones as well as ‘Smart’ TVs, so they understand wireless connections. They used that knowledge to make an application that can work with both Android and iOS devices to help them connect to the printer, an application called the ‘Samsung Mobile Print App’. 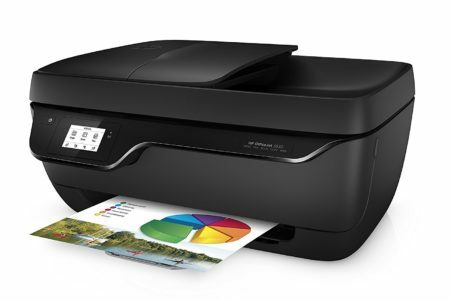 It also works with Google Cloud Print, AirPrint, and NFC Tap and Print. It also works on a wireless network, which makes it easy to use a router to set up a network. It is a monochrome printer, which is something important to be mindful of. If you’re looking for a printer that you can use to make beautiful photos or to make brochures or something like that, then you’re looking at the wrong printer. It prints at a print resolution of 1200 x 1200 dpi, which is ‘good enough’ for most offices uses. The real drawback to this printer, sadly, is the actual printing itself. If you need to have a high-resolution print made, or if you want to print something that will be in color, you must, sadly, look elsewhere. It is Amazon Replenishment Service enabled, which makes it easy to make sure that you don’t run out of ink at the worst possible time. This is a great personal-use printer for someone who doesn’t need to print in color, and someone who wants to use a printer that will be easy to work with? This is definitely the printer that you are going to want to go with. And it comes with great customer service, which is always a plus. 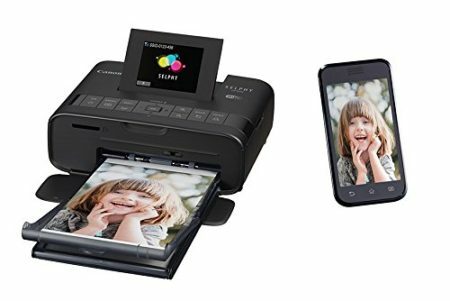 Imagine a printer that is basically built solely around the idea of printing out photos that you have taken, and doing so via a wireless connection. One that is made for you to be able to use easily and to print to wirelessly, leaving you with printed photographs that you don’t need to go to a shop to have processed. 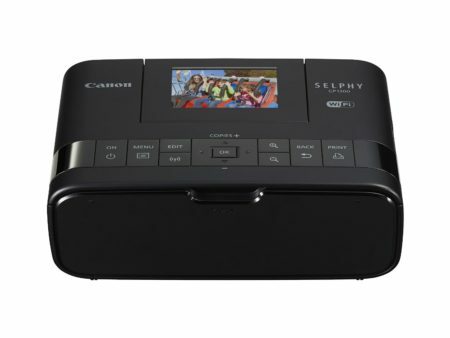 That is the gist of the Canon Selphy CP 1200 printer. Now, to be clear, this printer is ONLY for photos. If you want to print reports, or directions, or recipes, this isn’t for you. It prints photos that look like they’re actually going to be put in a picture frame or something similar, the same size as the photos you used to the printer after having film developed. You have to keep this in mind during the review of this printer, or else the printer won’t make much sense to you. This printer has an impressive 18 photo capacity in the tray. Again, you have to remember, these are photos, not sheets of legal paper, so that’s actually a pretty good capacity. It prints a color postcard-sized photo and will be able to do so in 47 seconds, roughly. It is capable of printing in resolutions of up to 300×300 dpi, printed in 256 layers, which means that you will end up with a photograph that looks beautiful, was printed on the cheap, and didn’t require you to wait while the local CVS or supermarket sent out prints out to be processed. This printer can be used for mobile applications, so long as you are willing to spend a bit of extra money on getting an accompanying battery. It’s a good idea if you want to print photos on the go and if you can’t find it in yourself to be patient for your picture. Personally, I can’t find a compelling reason to get the battery, but the choice is there. You may be wondering how well it works as a wireless printer, and the answer is that it is admirable. It can print via apps like PictBridge. It also has a slot for an SD card and a USB outlet for hooking up via a hardline. All this in an affordable and easily portable package. Thus far, we’ve mostly been reviewing printers that were obviously designed for home use. Sure, some of them are appropriate for a small home office, but most are made simply for use in the home, for personal uses and the like. 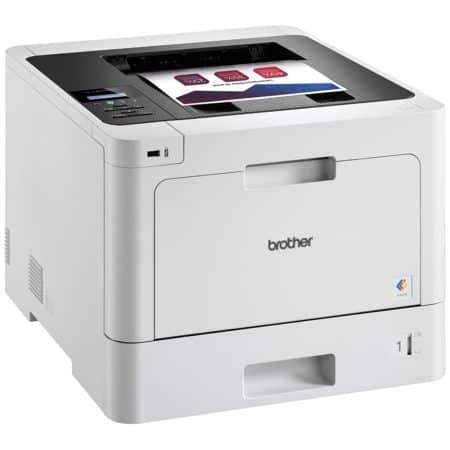 Aside from the OfficeJet Professional and the other Brother printer (the black and white one), there is no other printer on this list that could stand up to the strenuous use that you would need out of a printer you use at the office. It’s also another of these multi-purpose printers, being capable of scanning pages as well as printing. And, of course, since it can scan, it is also capable of copying pages on the go, at a resolution of 600 x 2400 dpi, which is respectable. It is also equipped with a 33.6K bps modem, so it can be used to fax, faxing at speeds up to 2.5 seconds per page. It’s always a good thing when you can replace what used to be an entire table full of office equipment with one (smaller) printer. Now, because it is a wireless printer, compatibility is an important thing. You can interface with this printer over a wireless network, of course, but you can also access it via the use of a USB port or an Ethernet cable. As far as its compatibility with applications goes, it is widely compatible. In fact, it can work with their own Brother application, ScanSoft PaperPort, and PageManager, among others. It works with a wide variety of mobile platforms, too, which is a nice touch if you’re looking to be able to print from your smartphone or your tablet or similar devices, and it makes use of Wi-Fi Direct as well as AirPrint. 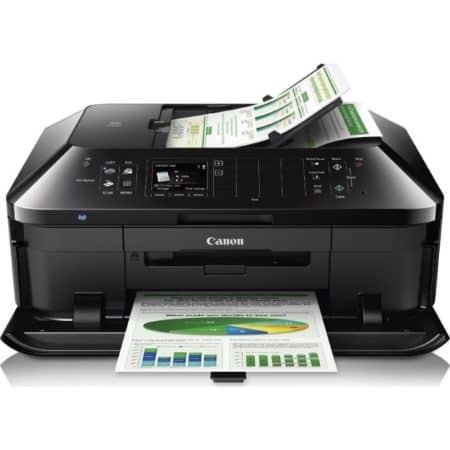 The video below will give you a nice overview of most of this wireless printers functions and features. It is capable of printing up to 27 pages per minute, which is not too shabby. It prints at a resolution of up to 2400 x 600 dpi, which is more than enough for most uses, especially when you realize that you’re printing in black and white and not color, and you’re not likely to be printing ‘image heavy’ pages, but rather documents and charts and graphs where color is not as important. Interestingly, while it can only print in black and white, the scanner does scan files in color, and you can save them to your computer in color. 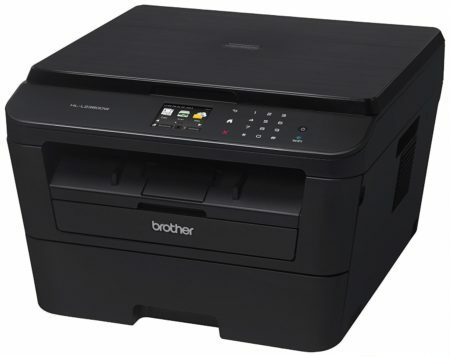 This offering from Brother comes with a recommended monthly duty cycle of 10,000 pages per month, which means that unless you’re constantly printing off a lot of pages, you’ll be fine to use it as an office printer. It also comes ready to work with Amazon Replenishment service, and if you’re going to be printing anywhere close to the 10,000 pages a month mentioned, it may be in your best interest to make sure that you make use of the service. We’ve talked before about how HP has a history in the printing industry, and how they’re known for the work that they’ve done. This printer is, without a doubt, a great asset to anyone who is looking to be able to have a nice printer for their home office or their small business and the kind of printer that will be of great value to them. As with many of the printers that we have looked at today, this one is an all-in-one printer, allowing you to do everything from your one printer. You can print, you can scan, you can copy, you can fax, you can even post to a handful of websites with the use of this printer. It can literally do it all, and it is very affordable. So, as a wireless printer, how well does it work? 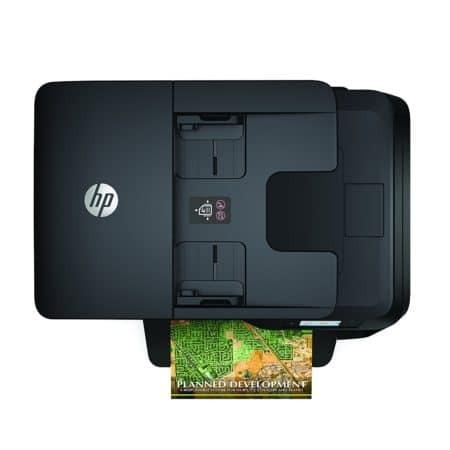 Well, if you’re one of those looking to be able to print to it with the use of a mobile device, you’ll be able to use the HP ePrint application, wireless direct printing, or you can even use Apple’s AirPrint. And if you’re not interested in using the new mobile methods of connecting to your printer, hey! That’s fine too! This printer has a USB port, as well as an Ethernet connection, and you can print through either of those. You can also hook up a USB drive to the printer and select the files to print via the use of the onboard controls, which is a lot easier for many people than hooking the USB drive into a computer and sending the files that way (and it cuts out a step, too, which is nice). The OfficeJet 6815 printer is a great printer for those who need to have an all-in-one printer, and want to be able to print in color. If you’re running a busy office, it may not be for you, but if you’re working from home, or if you just want a decent printer at a price that won’t end up breaking the bank, then this printer is definitely one you should look into. It is capable of interfacing with most common operating systems, and is very easy to work with in general, making printing in color a breeze. Just make sure that if you’re having trouble connecting to the printer, you check that you have downloaded the latest printer driver from the internet. A wireless printer is a complex piece of technology that performs a fairly simple task; putting ink to paper, reliably, quickly, and in a way that looks good. Figure out which of these printers may be the best for you can take some effort, and you probably have a few questions. Here are the answers to some of the most common questions. What Is The Difference Between Various Types Of Printers? Inkjet and laser printers are the most common printers on the home market at this moment, and they both have their advantages and disadvantages. The big difference, of course, is the way in which they get ink on the page. The inkjet printer sprays ink on the page in the various patterns according to whatever digital image you have given it to print. A laser printer is a bit more difficult to explain. It basically involves running a laser beam back and forth over a negatively-charged drum. The drum then collects the ink and rolls it onto the page as it passes by. It’s basically an electrostatic printing process, and that is an extremely basic description of the process. To learn more, click the links above. You can also watch the video below. Now, more likely than not, you’re wondering which is better for you. And the fact is that it’s hard to make a choice because they both are capable of producing quality pictures. They both tend to require you use specially-designed (made by the maker of your printer, often) cartridges or toner rolls that cost a lot. So, when it comes down to it, it’s really just personal preference. Some prefer inkjet printers for their convenience and the ease of replacing cartridges, others like laser printers more. Do I Really Need Color Printing? A lot of people don’t want to hear this, but if you’re getting a printer for your own office use, for your own home use, things like that, then you don’t really need to have color. You only really need color if you’re going to be turning in or handing out the things you make, or if you want to print up a lot of photographs from your home. The truth is that if you’re not doing anything that requires a color printer, you’re spending a lot of money on color ink cartridges or toner without any real payoff. What Is The Best Way To Hook Up To My Printer? In the wireless age, we love to hook up to things via wireless connections. As you saw in the reviews, most of these printers allow you to hook into them either wirelessly, or through a router in your home or small office. What is ‘best’ really depends on whether you’re going for a connection method that is stable or one that is convenient? For the most stable methods, a wire is almost always the best. Wireless connections are at the whims of other signals being broadcast throughout your home, plus there are so many more pieces of technology at play when you have to go through a router. A cord, be it a USB or ethernet cable, is the most stable way to connect to any printer and the one that is likely to require the least effort, too. When it comes to the easiest way to connect, it’s either going to be using a mobile connection or an application. For a lot of printers, their own application will be the easiest way to connect, because it is designed particularly to bridge that gap between mobile device and printer. We’ve looked at a lot of great printers today, but there can only be one printer that is truly the ‘best’ wireless printer. What would the best printer offer you? Would it be an all-in-one printer, one that can print, scan, copy, fax, and even upload directly to select internet sites? Would it be a ‘smart’ printer, one that can tell you when it needs new ink and even order that ink itself? What would it be able to do besides the basics of what a printer should do, besides simply printing? After consideration, and having spent a lot of time with these printers, there is a clear winner. That winner is the HP OfficeJet 6815. It’s a great printer for a lot of reasons. It does literally everything, even uploading scanned files or ‘copied’ files to the various cloud servers in common use, including Dropbox. It prints in a resolution that is good enough for making brochures or similar things to be passed out by your business, which is always a nice touch. Moving on, it prints in color, which is also a nice touch. It’s just an all-around good printer, and if you’re looking for one that will serve you well, this is the best one on the list. Whatever printer you pick from this list, though, you’re bound to be getting a printer that will serve you well for a long time to come, and that will provide beautiful quality prints.